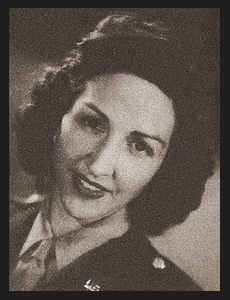 1st Lt. Marion Y. Kennedy, daughter of Mr. and Mrs. B. Ross Yerks, graduated from Abington Memorial Hospital School, PA. Wife of Maj. Willie B. Kennedy. Entered Army Nurse Corps in Jan., 1943, trained in Ft. Story Sta. Hosp., Va.; went overseas in April, 1943, served in N. Africa, Italy, and France; was discharged in May, 1945. Awarded ETO Ribbon with two Battle Stars.